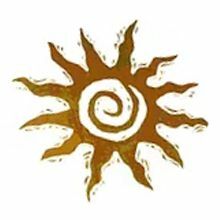 We stayed at Desert Rose for the month of November 2018. The house was immaculate, and the kitchen well stocked. The views were breathtaking and we could walk to many trails which was important to us. There was only two of us, and the second bedroom was perfect as an office. We really enjoyed viewing the stars each night from the hot tub! The staff at Red Rock Realty were very courteous and quick to respond to our needs. We will rent from Red Rock Realty again next year! Desert Rose was the perfect place for our first visit to Sedona. The location was ideal for road biking, running, and hiking. We were close to town, but able to avoid the traffic for most of the day. The rental itself had everything we needed to spread out, cook meals, and relax at the end of an active day. Dusty Rose was a great place to stay while hiking the many red rock trails throughout Sedona. My wife and I felt very much at home with a well stocked spacious kitchen, comfortable bed and laundry facilities. We cooked most evening meals while enjoying lunch at the various quaint restaurants nearby. Driving around town was easy and everything was only a short distance away. 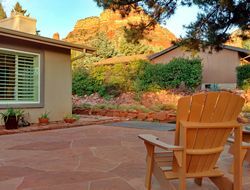 Late afternoons and early evenings were enjoyed with a cup of tea or wine sitting on the front patio enjoying the view of the red rocks. We had such a lovely stay at Desert Rose. The house is much bigger than it looks in the pictures and the outdoor space is simply spectacular. Sunrise coffee in the morning on the front porch and sunset drinks on the back patio, complete with a lovely hot tub. Everything we needed was provided - from kitchen supplies to make meals, to plenty of linens and towels for our stay. This is the second time we've rented from Red Rock Realty, and we highly recommend them. Very high-end, professional and accommodating. Stay here, you won't be disappointed!